The NASW Social Work Policy Institute joined with other professional and scientific societies in the Collaborative for Enhancing Diversity in Science to host the workshop, Enhancing Diversity in Science: Working Together to Develop Common Data, Measures, and Standards on May 24, 2012. 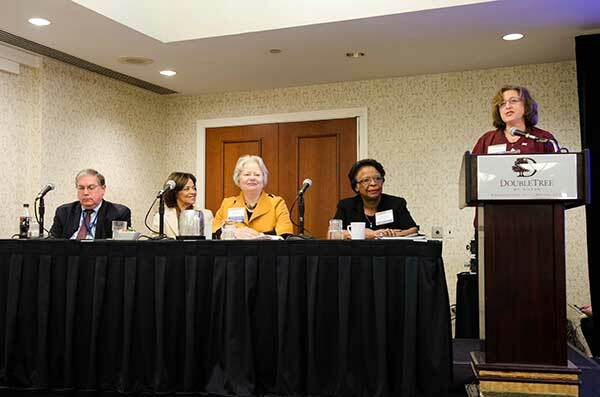 SWPI Director Joan Levy Zlotnik facilitated the opening session which included NIH Deputy Director Lawrence Tabak; NICHD Deputy Director Yvonne Maddox, American Sociological Association Executive Director Sally Hillsman and National Science Foundation Deputy Director Cora Marrett. • Establish a federal interagency working group of federal science agencies and the Department of Education to examine and define common data elements that all federally supported programs and individuals would be required to collect for tracking and evaluation purposes. • Develop a permanent central web-based repository for data on diverse populations in the science pipeline, as well as publications focusing on this issue. • Launch a new set of fellowships focused on increasing diversity in the scientific workforce using a public/private partnership and taking into account recent research and practice on the structuring of fellowships and training experiences.